Traditionally, all a zombie bride had to do to find a zombie groom was pick a man and turn him into a zombie. With the Dark Zombie Bride Costume, you will have men lining up to join the ranks of the walking dead, all for you. And that is a very good thing, because all this sleek and stylish costume is missing is a well-dressed zombie groom to stand at your side. This dress was designed by the very best designers just before they were zombified to ensure that it highlights your lady-like elegance. 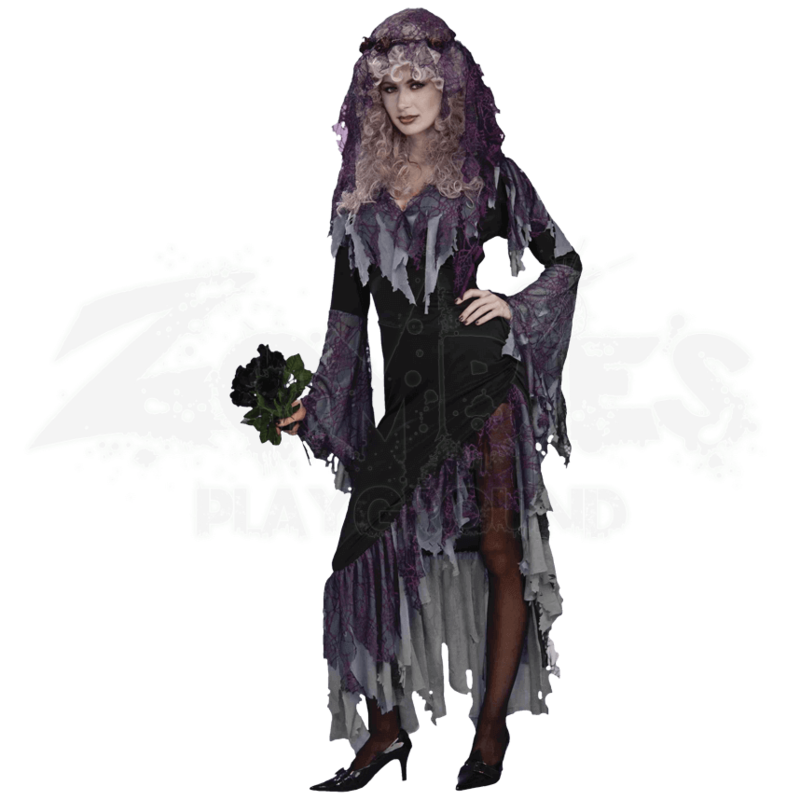 It is a simple black dress that features impressive decoration, consisting of sheer gray draping on the neckline, shoulders, and sleeves, as well as purple spider web decorations across the top of the draping. Matching tatters and spider web decorations hang from the slanted hem of the dress, giving it a distinctive and impressive style. Of course, this undead bridal dress costume also includes a spider web headpiece that you can wear to the happiest day of your un-life. The costume includes only the dress and the headpiece. The bouquet, stockings, and shoes are not included. The dress only comes in one standard size. Once you don the Dark Zombie Bride Costume, the only words you will want to hear are I now pronounce you man and zombie. You may turn your groom.